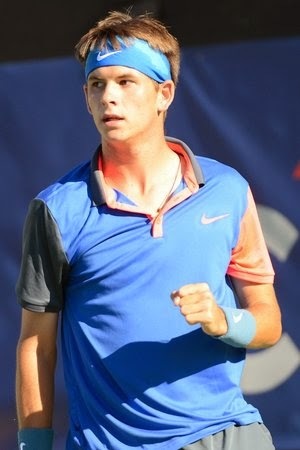 18 year old Jared Donaldson claimed his maiden challenger titles two weeks ago in Maui, sweeping the Singles and Doubles (partnering fellow teen Stefan Kozlov). And earlier this week, the American won his first career ATP match in Memphis (defeated Kozlov) before falling to compatriot and former Top 20 player, Sam Querrey. The Rhode Island native was kind enough to give up his time to do a Question&Answer for us. Continue reading to see what JD had to say about his game, memorable experiences, career approach and more! Can you describe your game style? Favorite shot and part of the game you look to improve upon? Well, I would say I am an aggressive baseliner. I want to be able to be versatile. So I work on finishing at the net. But like Roger [Federer] told me in Dubai that he feels all a player needs to do is finish at the net today, to approach and volley is almost not worth practicing. With that said, the ability to recognize the time to come in is something I am focusing on. So I want to be an aggressive solid baseliner with the ability to close and finish at the net if the opportunity presents itself. If you can hit with any player, who would it be and why? Well, I would love to hit with Marat [Safin]. I feel like he was so intense and fun to watch. But to hit with Novak [Djokovic] right now and play against him would be the best. He is so good and does everything so well. I feel like I could learn so much hitting with him so I would pick Novak if I had to pick a player to hit with. Actually, I really don't have anything like that. I don't get hung up on must dos just in case I can't do the must do. But typically I like to visit the physio, listen to music, and talk to my coach, and just stay relaxed prior to my match. If I had to play for my life I would pick hard, but I feel comfortable on clay. I have done well on the clay tournaments I have played on clay and spent 2.5 years on the red clay in Argentina where I learned a lot. So I don't mind playing on clay. I feel like to be good today you need be able and willing to compete on all surfaces. One game, as shown by the best, can win on all surfaces so I really don't like to pick a favorite. I feel like my attitude should be to learn to compete my best on both clay, grass and hard. What are the biggest differences between juniors and pros? I feel like in general some guys in the Juniors could do different things, but in general being consistent and moving well is the general trait of a great junior. While the pros are solid, aggressive, big serve, and mentally tough. They do it all. But Juniors is important, as one of the teaching Pros used to tell me when I played Top Serve (which is a men's open tournament down there), that I could play against older guys who could beat me but that it was important to play high junior tournaments. Because then, you are playing some of the best minds in tennis. So both are important, but now that I am playing ATP level tournaments I see all top minds, mentally tough, they move great, solid, aggressive, and they have the serve. It's tough. Have been following your progress since you were 15 years old so your triumph in Maui was not a surprise. However, the doubles title was unexpected. What’s the key to the improvement in your doubles success? Picking a good partner. Actually, I might have been more surprised than you. I don't train or even practice doubles. I actually find it tough to find enough hours in a day to work on everything I need to work on for singles. I only play doubles with a friend or with a great doubles player. I think last year, I only played doubles two times with Farris [Gosea] (a friend from University of Illinois). Once with Mike [Russell] at the Open and with Stefan [Kozlov] in DC and Maui. I think that is all I played doubles. So it is something I do sometimes, but I would rather have the time to rest or go work on my serve or what ever else I feel like I need to do after my match. I just have so much to learn and work on for singles and feel like that should be my focus for now to reach my dreams. Best advice someone gave you or lesson learned during your two years in Argentina? No matter the ranking, no points, trying to get points, 1000 in the world, 750, or even top 100 they all work so hard and are willing to make huge sacrifices for their dreams. It is hard to understand, but these guys have to deal with a peso that doesn't go far and it is tough to get dollars. Many can only play in Argentina. They don't have the opportunity to travel and play in other parts of the world. They all do fitness 2.5 hrs a day a minimum and work real hard. I realized and was taught what commitment was and not to take for granted the opportunities I have been given. I don't take anything for granted. I want to take advantage of all that I have and need to also understand that if I don't have all I need or want that it is not an excuse that I need to try to figure out a way and make do. You made your US Open main draw debut against Gael Monfils last year. Can you describe what went through your mind during the match and what have you learned from the experience? Playing Gael was so much fun. It will be a memory I will never forget. I was told to not be surprised if the fans start rooting for Gael, as they tend to love him. So I didn't know what to expect. But once I entered the stadium, it was electric. It reminded me of how Andy Murray said that the US Open was his favorite tournament. So much energy and so much fun. I felt I played well, obviously not good enough to win but good enough to feel like if I work hard enough I can get there. I have to say the fans were so nice and supportive and I was surprised, based upon what I was told how much support I got. It was a sensation I want to feel again and will work as hard as I can to try and make it part of my life every August. Had to be my first ATP point. I went to Venezuela with my coach from Argentina, Pablo Bianchi. I went because it was my goal to get a point so I could pick my futures I would go to. So I won my first round of qualies easily, then played a tough guy from Argentina in the last round. I won and was in the main. I was so happy, then the draw came out and I got Maxi Estevez who Pablo used to coach. He was the one seed and about 270 ATP. I wasn't nervous until after the first game. Then I thought I could win this match. I lost the first, won the second, and then I was up 5-2 in the third playing amazing. I was serving for the match and then at match point I had a volley sitter and hit the fence. It was so hard. Not only was I playing for my first point, but I was beating the one seed. Anyway, I finally won the match and walked off the court crying. It was so emotional I will never forget that feeling. My first point. I played with guys in Argentina who had been playing to get their first point for years. It was a big deal for me. If you can change one thing about the pro tour, what would it be and why? For sure, shot spot on every court and instant replay. I have to say when I played in the doubles in DC against the Bryans and we had a chance to challenge, I began to think maybe I wasn't always right and the chair or the lines judges weren't always wrong. To be the best I can be, but my goal is to win a grand slam(s). For me, as I have only played a few ATP but it has to be the US Open. Your favorite Muhammad Ali quotes? A person who views life at 50 the same as he did at 20 has wasted 30 years of his life. Goals for 2015 & upcoming travel plans? This may sound cliché but it is true, I want to win every match I play but only if I can do it working and playing the style I am working on. It is important for me to not worry and get hung up on and worry about my ranking right now. I have so much to improve and learn that I need to keep my eyes on the ball and focus on development. I feel like I have 4 years to do this, then it will be about winning. It is tough because when I change something and or add a different shot, it is hard to do in matches but over time I will work to be the best I can be. My goal is to play a mix of ATP and challengers depending on how I am doing. I think I will try to play qualies in all the slams, some ATP and fill in with challengers. I will play Delray, (I won the Boys 12's there so that will be fun), Acapulco qualies, Indian Wells qualies, 3 US clay challengers then head to Europe. And yes Rado is a sponsor of mine. Saw your tweet.